I have only hired a maid once in my life, and that was because the doctor ordered me to get help while I recovered from a serious illness. As soon as I got better, the maid’s weekly visits came to an end. Truth be told, I missed her. Even in our modern world with so many conveniences, I sometimes wished I could just have my servants do at least some of the housework. Servants in “Emma” (1996) haul the food and chairs for the picnic. 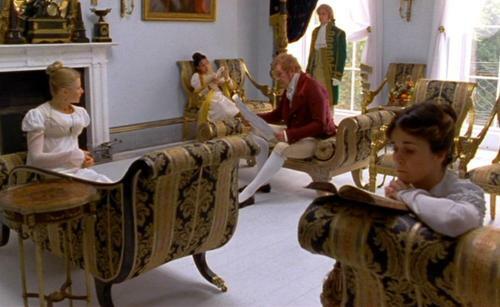 Characters from “Persuasion” (1995) enjoy leisure time thanks to servants. .Jane Austen may not have done much housework in her lifetime, but she has helped me more than any maid. Now that I spend so much time writing, I rely on audiobooks. I have fond memories of listening to Sense and Sensibility while I painted my living room, Mansfield Park while I canned jam from my apricot trees, and most recently Northanger Abbey while I deep cleaned the kitchen. I have to confess that I didn’t really enjoy Northanger Abbey until I heard it read by a skilled narrator. Doing the dishes is so much more enjoyable when I’m listening to professional actors reading my favorite books. Willoughby reads in “Sense and Sensibility” (2008). I’m able to get Austen’s books on CDs from my local library, but I have sometimes downloaded free mp3 files from librivox.com, a site that shares free public domain audiobooks. As with other sites, the quality of the narrators varies. I loved the narrator for Pride and Prejudice, but some other narrations weren’t as great, so it helps to listen before you download. Librivox also has free downloads of Jane Austen’s other works like Love and Friendship and Lady Susan. We get a glimpse of a servant changing linens in “Pride and Prejudice” (2005). I was happy to learn that several of the Austen authors have audiobooks available for us to listen to. Pam Dixon, Regina Jeffers, Katherine Reay, and Barbara Silkstone have titles available on audible.com. (Some of these are also available on Amazon and iTunes.) Also, look for audiobooks from Elizabeth Ann West, Melanie Schertz, and Jeanna Ellsworth in the future. Drying clothes at the Lambton Inn in “Pride and Prejudice” (1980). As for other chores, I love to fold laundry and file papers while I’m watching Austen-inspired movies. There are so many movies to choose from that I still haven’t exhausted all the possibilities. My to-watch list includes the old version of Pride and Prejudice with Laurence Olivier and a few versions of Northanger Abbey. Not to mention that I haven’t seen all the fan fiction-inspired movies. What a great incentive to do my work! What have you done to make your chores go faster? Or can you recommend an audiobook or movie? 60/40 … 80/20 …The low number gets the housework. lol, Jen. That’s the way it should be. Wow. You read a chapter for each chore completed? If I begin to read the house could burn down around me and I wouldn’t notice. Pretty amazing. I tend to be the same way. That’s why I do audiobooks. I can be reading even when I’m not reading. Knew that there was a reason I loved Erma…GOD rest her soul! Erma is so funny. I haven’t been as disciplined lately. Once I start reading, that’s pretty much it for the chores. I usually have to make myself do the bulk of my chores before I get to read. What a wonderful idea. I have rewarded my children for chores done but never myself. I should try it. I do listen to audiobooks sometimes while working at my desk. For some reason it really helps. I do have to be careful. Once I transcribed a paragraph from one of Regina’s books into my report. That’s funny about you and Regina’s book. I don’t know if I could listen and do reports–though I do the bills while I listen. this was such a wonderful article! I’m glad you were able to get through your chores in a more enjoyable way! Thanks, Charlene. It makes it much more fun. Thanks for the great post Rebecca! Music makes chores more enjoyable! I also remind myself that the sooner I am done, the sooner I can read! Thanks for commenting, carylkane. It’s fun to meet others who use books as rewards. I’m going to really deserve a good read after I finish cleaning the kitchen today. Would you share your favorite audiobook narrators? It makes such a difference! Thanks for commenting, Cecilia. That’s a great idea. I need to keep better track of the best narrators. One I remember liking lately is Cassandra Campbell. I also got a kick out of hearing Richard Armitage read one of Georgette Hyer’s novels. I think it might be the only one he’s done. I’ll have to come back later with the title. I also enjoyed Natasha Richardson’s version of The BFG by Roald Dahl. And of course, everyone raves about Jim Dale’s reading of the Harry Potter books. The one Richard Armitage reads is called “Sylvester.” I mostly thought it was fun because I enjoy him as an actor. As far I know, he hasn’t narrated any others. Sorry I’m writing so many comments. I just figured out my favorite narrator for Northanger Abbey. It was Anna Massey. I understand that. I can’t write and listen to music. I wish I could do my books on audio too. My problem is that I have a traditional publisher, who bought the rights to all forms of my book. So far, they haven’t done any fiction audiobooks. I do watch DVDs while Ironing but that is a stationary chore. While doing others…if it is not vacuuming, I listen and sing along with favorite music on my iPod or just the radio or on downloaded favorite lists on iTunes. I have listened to stories while driving long distances but find that I blank out and miss portions if I am distracted while cleaning and trying to listen to a story. Like Joana, now that I am retired it is more “a lick and a promise”. Although if the children and grandchildren are to visit I do make more of an effort. Thanks for sharing. Thanks for sharing your tips, Sheila! Blanking out is sometimes a problem with me too, especially when I’m first starting a story. Sometitmes I have to listen to the first chapter twice. Thanks for the lovely post, Rebecca! What a great idea, to make chores more palatable like that. I’ll definitely try your method, and maybe my house would look better than it does at the moment. For now, my approach is more like ‘Thank goodness I found I book, I very nearly started cleaning 😀 ‘ Never thought the two don’t have to be mutually exclusive. Have a great summer! Thanks, Joana. It is sometimes quite obvious when I haven’t had a good book to listen to for a while. I have a dog and kids, so it can get ugly pretty fast around here. I absolutely loved your comment “Thanks goodness I found a book, I very nearly started cleaning” — I hope you don’t mind if I share that with my bookclub! Priceless and EXACTLY my philosophy!